Nifty opened weak and struggled to move above the dotted line for the entire session of the day, and saw huge sell-off towards the end to close at 6483.10, a huge loss of 40.95 points. The broader market was also weak, with 585 advances to 884 declines. Best support for the series at 6400 and resistance at 6600. Call option 6500-6600 added 12.89 lacs huge amount of OI with profit booking seen at 6700 and above strike prices. Put option 6400 added 3.71 lacs huge amount of OI with huge short covering seen at 6500 and above strike prices. Nifty Open Interest is at 1,92,89,100 down by 6,64,550, whereas April Series added 1.93 lacs with decrease in price, most probably small rollover with huge long liquidation. Bank Nifty Open Interest is at 17,54,025 down by 1,32,225, whereas April Series added just 0.16 lacs with decrease in price, most probably small rollover with huge long liquidation. FII’s sold 2.16 lacs Futures, mostly long liquidation, as their net OI decreased by 8409 contracts (includes 49324 longs to 53641 shorts for the day) and the average price per contract comes to around 6460.19. FII’s future open contract as on date is 510521. PCR Open Interest (Volume) has moved down to 1.295. 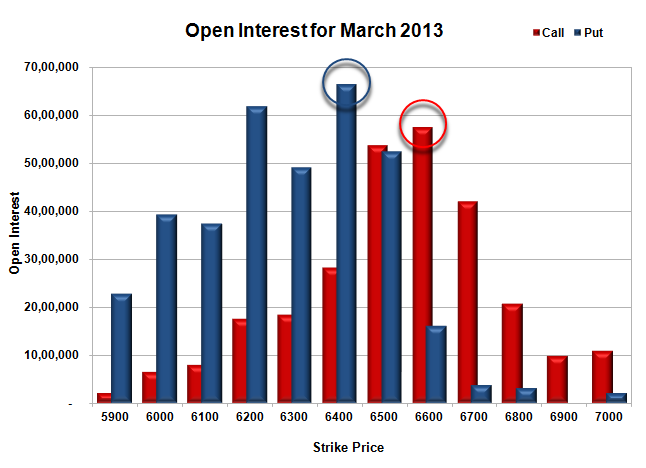 Initial and best support at 6400, with highest OI of 66.40 lacs. 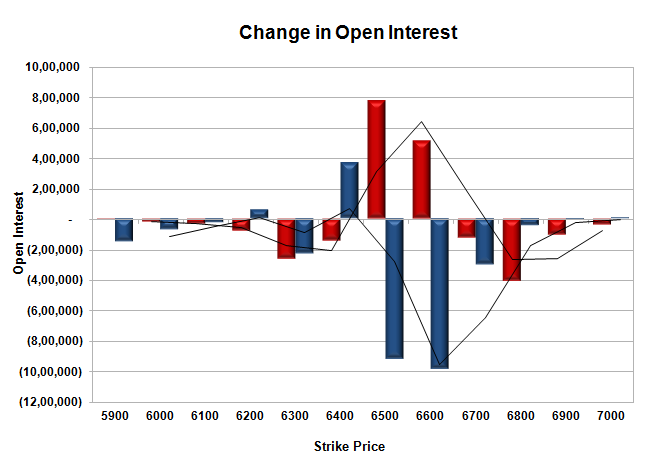 Initial and best resistance at 6600, with OI of 57.42 lacs. 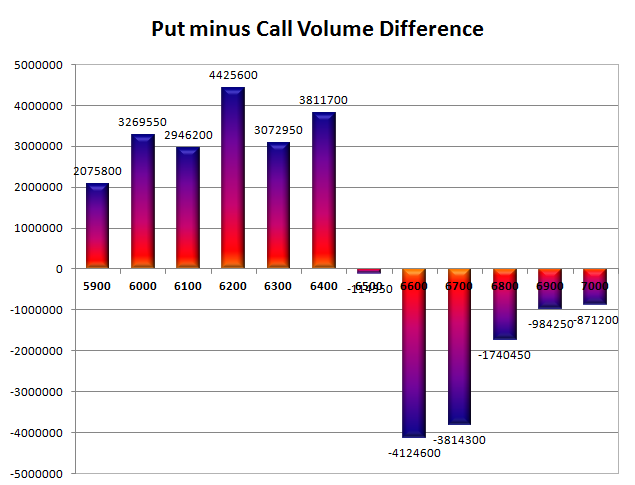 Day Range as per Option Table is 6440 - 6541 and as per VIX is 6426 - 6540 with 6493 as the Pivot.